RUSH: Now, CPAC. I don’t know if you get this same impression, but it seems to me that the Drive-Bys are spending more time covering everything at CPAC this year than they normally do. Now, C-SPAN is there for the most part wall-to-wall every year. But some of these cable networks are also going wall-to-wall with it, too. There is a fascination with what’s happening there, and it’s actually good because there are a lot of really, really great future stars on display, and they’re not holding back. 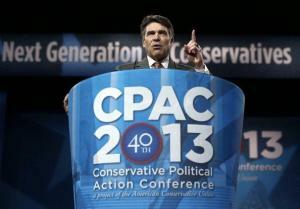 So Rick Perry is slamming McCain and slamming Romney, saying they’re not conservative. Then Pat Caddell… This is unfortunate. We have scoured everywhere. We called C-SPAN. We looked at every cable network. We cannot find any video to cull audio from of Pat Caddell, but Pat Caddell blew the place up as well. Now, he’s a Fox News contributor, a Democrat pollster. He worked for Jimmy Carter 1976, and he’s still a Democrat. He’s a frustrated Democrat, but he still is one. He blew the lid off of CPAC two days ago. His message was that the Republican consultant class is taking the party down the tubes, that they’re making filthy amounts of money — $150 million a campaign — whether the candidate wins or loses. It’s a “closed set,” so to speak. It’s a very close-knit, closed group, these consultants, and they trade candidates and candidacies from year to year and they go back and forth. They’re all moderates. None of them are really conservative. They say they are, and they think they’ve got the recipe to win. What have I told you about all these consultants? What they do, the way they approach all these Republicans is they say, “It’s independents where elections are won.” Now, keep this in mind, folks, this whole theory was also blown up in the last election. They go to the candidate and say, “Look, it’s independents. You know that the Democrats are gonna get their Democrat voters, and you’re gonna get your Republicans. The independents are the key, and I’m the guy — I’m the consultant — that can devise the strategy and the ad campaign to get the independents,” and the candidates fall for it year after year after year. RUSH: Now, back to this consultant business. We discuss this I don’t know how often, but frequently on this program, and there’s a formula that these guys use. They pitch these candidates with the formula, and the candidates seem to routinely go for it. And the formula is this: The Democrats are gonna automatically get 40% of the vote; that’s their base. The Republicans are gonna automatically get 40% of the vote; that’s their base. Grand total, 80%. And, therefore, every election is won by who gets the majority of that 20%. And that is why we end up being so frustrated with Republican campaigns. It’s by definition they’re not going to campaign as conservatives. They think people in the middle, these great moderate independents, aren’t conservative. And, furthermore, they think that conservatism scares these people. They make no effort to educate or inform or correct that impression. They just accept it and then proceed on the assumption that these people in the 20% don’t have any core principles or beliefs and so you gotta go out and buy their votes or cajole them one way or the other. So they go to the candidate and say, “Look, we’re the guys that know best how to get that 20%. We got the right ad campaigns. We’ve got the great polling units. We do the focus groups.” And the candidates fall for it. We’re watching this and I hit the pause, turned to Kathryn, and said, “It’s exactly what happens. They’ve got it.” And this is a program not made for conservatives. This is exactly what happens. Well, anyway, the candidate’s wife, Julianna Margulies, shows up, watches this debate, and can’t believe what she’s seeing. Her husband’s behaving like a wuss, behaving like a wimp. And she’s, “Come on, Peter, come on, Peter, fight back on this stuff, fight back.” Then they have a break in the debate. They have a snarky female moderator. It’s a long enough break for this guy to call the old consultant who is in trouble with the law and is no longer on the job, but the wife insisted he call the old consultant, so he does. I’ve always been confused by it because we’re told that any time a Republican gets aggressive, any time a Republican starts attacking or trying to define his opponent, the independent gets scared to death and they’re gonna run right back to the arms of the Democrat candidate. Except the problem I’ve always had is the Democrats are the meanest, most extreme, insufferable. There’s nothing nice about them. They never talk about bipartisanship. Well, Obama talks about it. That’s the key. But they’re not interested in it. They never compromise. They don’t do anything. And look at how they talk about Republicans. Somehow that doesn’t scare the independents. The Democrats can say anything in the world about our candidates. They can lie. They can accuse Romney of letting a guy’s wife die with cancer. They can accuse Romney of not caring about his dog by putting him on the roof of the family sedan on vacation. They can accuse Romney of not paying his taxes, hiding money in the Caymans. Somehow that never, ever bothers the independents. But they convinced Romney, “If you go after Obama on Benghazi, the independents aren’t gonna like that. You just don’t do it.” So Romney sat there and went into prevent defense after the first debate, and you know what happened? He won the independents, just like these brainiacs said. He won the independents double digits, but four million conservatives sat home and didn’t vote. If the consultants had had a different theory, if Romney had followed his instincts a little bit more — I know he wanted to go after Obama. There’s nobody in the world that doesn’t. It’s just everybody’s been scared off of it because of race, the allegation of racism, so he dialed it back, and we all see the result. What happened with that is the conservative base said, “I’m not fired up here, there’s no reason.” They’re fed up. They send all the money to the Republican Party. They get nothing back for it, so they just stayed home. Now, some of you might say, “But didn’t they realize what an absolute disaster four more years of Obama –” Yeah, I think they did, but they had so much more negative emotion aimed at the Republicans than they did at Obama. So they sat home. Obama got many millions fewer votes in 2012 than he did in ’08. And Romney got four million fewer Republican votes than McCain did. That’s hard to do. But he did it. And if that hadn’t happened we would be talking about President Romney today. So Caddell and the rest of these guys are watching all this, and they’re beside themselves. They cannot understand how this continues to happen while Republicans continue to lose, and while it all goes on, the consultants are getting rich to the tune of hundreds of millions of dollars. One of the ways it works is that the consultant gets the advertising commission. Every dollar spent on advertising there’s a 15% sales commission on it, the advertising agency gets. In this case the consultant is the agency. So if the consultant decides, you know, we’re gonna spend a hundred million dollars on advertising, he’s writing a check to himself for $15 million. It doesn’t matter whether the candidate wins or loses, and it doesn’t matter whether the ads are any good. So this is what Caddell said. This is the foundation for Caddell’s speech at CPAC, and he launched. “‘I blame the donors who allow themselves to be played for marks. I blame the people in the grassroots for allowing themselves to be played for suckers….It’s time to stop being marks. It’s time to stop being suckers. It’s time for you people to get real,’ he told the audience that included two top Republican consultants.” Like I said, we searched around the world for video and audio of this to let you hear it in his own words. I don’t think there is any. “When you have the Chief of Staff of the Republican National Committee and the political director of the Romney campaign, and their two companies get $150 million at the end of the campaign for the ‘fantastic’ get-out-the-vote program … some of this borders on RICO [the 1970 Racketeer Influenced and Corrupt Organizations Act] violations.” Racketeering is what Caddell essentially is accusing these people of engaging in. Get-out-the-vote program? That’s what the consultants advise: “Okay, we’re gonna talk to Hispanics, and let ’em know if you’re amnesty. You’re gonna try to get the women’s vote. Let ’em know that you’re maybe a little open-minded. You maybe might not fight Roe v. Wade so much.” In the meantime, you rip the core foundation right out from underneath your party, and what did you do? You fragment. You fragment the party and you blow it up. That’s exactly what has happened here. Because I don’t think the party knows what it is anymore. It’s certainly not confident where it is. So they’re in a totally defensive posture, and in many cases this is the attitude that is referred to in these campaigns. “‘The Republican Party,’ Caddell continued, ‘is in the grips of what I call the CLEC–the consultant, lobbyist, and establishment complex.’ Caddell described CLEC as a self serving interconnected network of individuals and organizations interested in preserving their own power far more than they’re interested in winning elections. “‘Just follow the money,’ Caddell told a rapt audience. ‘It’s all there in the newspaper. The way it works is this–ever since we centralized politics in Washington, the House campaign committee and the Senate campaign committee, they decide who they think should run. You hire these people on the accredited list [they say to candidates] otherwise we won’t give you money. You hire my friend or else. '” What he means is some senator will run the Republican Senatorial Campaign Committee. His job is to get as many Republicans elected to the Senate as possible. So candidate Ted Cruz, for example (just pick a name) is running for the Senate in Texas. What happens is, the Washington-based party goes to Cruz and says, “Here. Hire this consultant or we’re not gonna give you any money.” Now, I don’t know how this happened with Cruz. I’m just using him as an example. He’s a well-known name, and he ran, and he won. It’s a very closed group. So what Caddell is alleging here is that the most important thing in a campaign is hiring the consultant. That’s how you get campaign contributions. The consultant gets paid and that’s how we all stay in business — and whether or not you win the election is an afterthought. That’s what he’s accusing these people of, and that’s what he said in his CPAC speech, and he wasn’t even through. He had more. RUSH:Let me conclude this Pat Caddell business with the Republican consultants. You know, this stuff is really important. People ask, “Why did we lose the election?” Everybody thought we were gonna win that. I mean, everybody. Everybody thought the polls were wrong. Had the turnout reflected the possible conservative enthusiasm out there, Romney would have won. But there was this plan to just ignore the conservatives, take ’em for granted. “They’re gonna be there — and if they’re not, we don’t care. “Just go for the independents. Go for that chunk of people in the middle,” and as I say Romney, in the five battleground states, won independents. This is the precise statistic. Because overall, in all states, Romney won independents by 5%. But in the battleground states — in the five battleground states — he won independents by ten to 12% and lost the election. All these wizards of smart were stunned! They couldn’t believe it. You’re happy to be walked all over. You’re just happy to be in the game. You’re happy to be acknowledged. He does not know how right he is! Washington is a town run by the left. It’s run by liberal Democrats, and not just in the power sense in politics, but socially as well. Everybody wants to be liked. I tell you, folks, I really believe the pursuit to make everybody like you is the greatest prison you could put yourself in. You end up denying who did you really are. You’re afraid to be who did you really are! If your quest is to be liked, if your quest is to be accepted — and everybody wants to be. This is what’s so hard about it. We’re all raised to make people like us. We’re all raised, “Don’t you offend me!” Mom and dad say, “Don’t you make our family look bad!” In high school, everybody wants to be in the big clique. It’s seductive to be popular, to be liked. But I think generally in life, politics particularly, if you pursue that course of being liked, and you go overboard on it, you cease being who you are, and you end up not even knowing who you are. You try to be all things to all people, and that can’t be done. I think the Republicans have been so beat up by the media over the years, and the media and the Democrats run that town where they live. Nobody wants to get beat up. Nobody wants to be savaged in the media. When Romney did not go after Obama on Benghazi in the last debate, the last two debates, I remember seeing Caddell on TV just beside himself. But he launched both barrels at CPAC. He let ’em have it. Hot Air: Rick Perry at CPAC: How Can the Last Two Elections be a Rejection of Conservatism When We DidnÂ’t Nominate Conservatives?